Oooh, new historical fiction! This one about Queen Victoria! You already know I’m pretty much going to eat this up. Especially when I previously enjoyed other books by this author. THE PLOT: The story covers a relatively short period in Victoria’s life: from right before her ascension to the throne up to her engagement to Prince Albert. 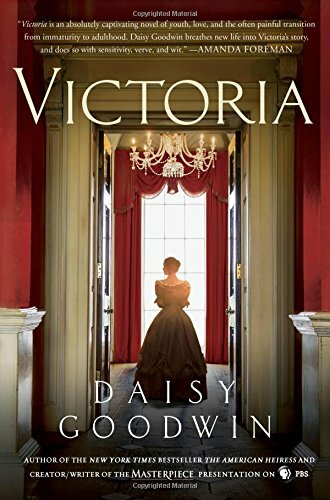 Most of the plot centers around Victoria’s fascination with her much older Prime Minister, Lord Melbourne; but there are also the twists and turns of people trying to manipulate the sheltered teenage queen. There’s her mother’s companion, John Conroy, who was sorry that Victoria didn’t become queen before her 18th birthday and therefore require a regency. (Which, of course would have been run by her mother and him…so, mostly him.) Her paternal uncle, the Duke of Cumberland and King of Hanover, is annoyed that England didn’t have laws preventing a female from inheriting the throne, which would have made him King of England. Her maternal uncle, the King of Belgium, is adamant that Victoria should marry his nephew Albert so she is “guided” by the Coburgs. Everyone agrees that she must marry quickly so there’s a steadying male influence on the giddy young girl. The one thing they all agree on is that the husband cannot be Lord Melbourne, no matter how much Victoria might wish it. MY TWO CENTS: I didn’t realize that Daisy Goodwin had written the Masterpiece drama coming to PBS, starring Jenna Coleman and Rufus Sewell. This book is kind of the novelization of that. I was already looking forward to it, so reading this just helped build more excitement. This book is a pretty quick read. It’s broken into four parts, and the chapters within each part are fairly short. It’s easy to pick up and put down, although I mostly just wanted to keep reading once I was in it. I felt very connected to the character of Victoria. She seemed very authentic to me, both as an 18-year-old girl, and a very sheltered individual who is suddenly queen. Her mother and Conroy certainly didn’t do her any favors by keeping her so isolated. How could she learn to relate to people when she wasn’t allowed? How could she learn to be a good queen in a vacuum? And some of her early major missteps reflect that. I really enjoyed this book…right up until Albert’s entrance, which was about 75% of the way through. The rest of the book focused on the not-quite-a-romance between Victoria and her Lord M. People keep trying to push Albert at her (in his absence), and she wants nothing to do with that path. She didn’t like Albert the last time she saw him, and the more people push, the less she’s interested. COVER NOTES: The cover is reminiscent of Goodwin’s book The American Heiress. Simple but elegant. I wonder if that is Jenna Coleman as Victoria, and the rooms are from sets used in the production. BOTTOM LINE: An enjoyable, quick, easy read. A little too rushed at the end for my taste. Looking forward to checking out the Masterpiece Presentation on PBS! ON SALE DATE: Available November 22, 2016, in hardcover and eformats. Note: Review is based on an ARC provided by the publisher via Netgalley and Amazon Vine in exchange for an honest review. 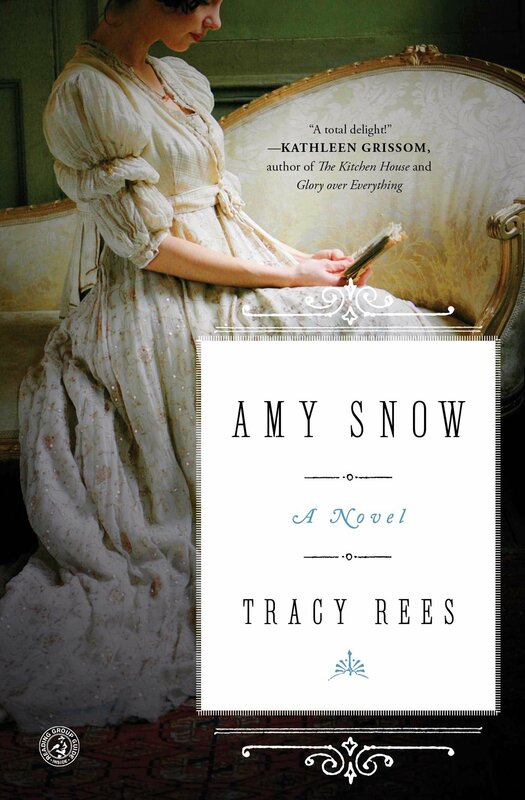 Amy Snow caught my attention right away, and I was excited to have the opportunity to check out an advanced copy this new Victorian novel. This is a mystery story, but also a story about a teenage girl discovering who she wants to be and, better yet, can be. THE PLOT: Amy Snow was abandoned as a newborn and found and rescued by eight-year-old Lady Aurelia Vennaway. The Vennaways kept the infant, but while Aurelia adopts her as a little sister, the Vennaway parents are less than welcoming. Aurelia’s father is mostly indifferent, but her mother is especially venomous toward little Amy. She is kept in the servant’s quarters until Aurelia is old enough to demand Amy as her companion. At first, the story alternates between Amy’s present and her past with Aurelia. In the present, Aurelia has died and left 17-year-old Amy money and clues to a “treasure hunt,” which will eventually lead Amy to a carefully hidden secret. In flashbacks, Amy tells of when Aurelia collapsed and was told she was dying. Aurelia heads off to travel the countryside, leaving Amy behind. Aurelia’s formerly frequent and descriptive letters to Amy become rare and detached, and she stays away much longer than originally planned. But when she unexpectedly arrives home, her bond with Amy becomes stronger than ever. When Aurelia dies three years later, the Vennaways banish Amy from their home. The story then follows Amy on her quest, starting out with ten pounds and a letter from Aurelia and taking her to meet new people, make new friends for the first time, experience some romance, and ultimately understand much more about her beloved friend as well as herself. MY TWO CENTS: There are really two mysteries here: where Amy came from, and what Aurelia wants her to discover. While these keep the reader’s interest, the real star of this book is Amy’s journey. She doesn’t even know her own origins and has lived her whole life at the whim of the Vennaways. She’s hated and scorned by Lady Vennaway, while treated as a pet, almost an accessory, by Aurelia. Aurelia’s final gift to Amy isn’t so much money and beautiful clothes, although that’s part of it. What she really does is provide Amy with courage, problem-solving skills, and self-confidence. The quest takes Amy from a shadow to the person who makes decisions, right or wrong. And as Amy begins to understand how Aurelia felt trapped by various circumstances, she better understands how important her own independence is. Amy also gets a taste of romance for the first time in her life. At her first stop, she meets a young man who captures her interest and seems a kindred spirit. But she also meets a young gentleman who begins courting her in earnest. Why would a well-known gentleman be interesting in a foundling like Amy Snow, and why would he continue to pursue her as she travels? BOTTOM LINE: Once I started reading, I didn’t want to put it down. Not exactly a Gothic novel, but very throwback in tone…I especially liked Amy’s love for Mr. Dickens. 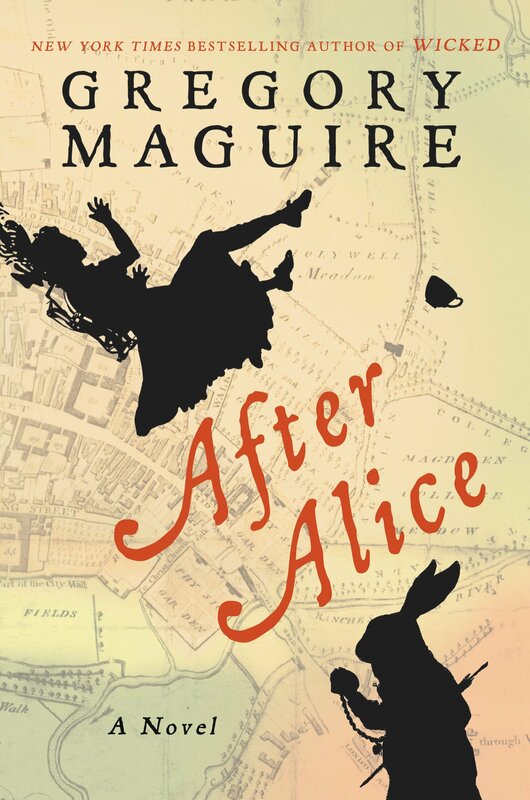 I very much enjoyed this first novel from Rees and will be looking forward to her second. ON SALE DATE: Available June 7, 2016, in trade paperback, eformats, and audio. NEXT UP FROM THIS AUTHOR: Rees’s second novel, Florence Grace, will be available in the UK on June 30, 2016. No official word yet on the US publication, but if you want it immediately, try Book Depository. 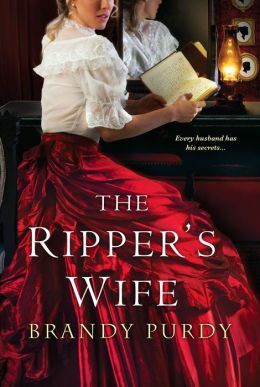 In The Ripper’s Wife, Brandy Purdy marries two true stories: that of Jack the Ripper, whose identity remains unknown (unless you believe this), and the story of James and Florence Maybrick. While some evidence suggests that James Maybrick was the Ripper, none of it is authenticated. When you choose to read a novel about Jack the Ripper, you can’t expect it to be wildly pleasant. I didn’t know the real story of James and Florence Maybrick, but if you do, you know that’s not very pleasant either. Readers shouldn’t go into this book expecting a heartwarming story that will leave them feeling good. THE PLOT: Florence Chandler and James Maybrick meet on a ship and have a whirlwind courtship. Florie is 18 and American. Maybrick is English and in his 40s, but these differences don’t matter as much to them as they do to others. They marry, have a magical honeymoon, and settle in Jim’s home…and that’s where everything goes wrong. Jim is a hypochondriac addicted to arsenic, strychnine, cough syrups, and various other snake-oil remedies. When Florie discovers his well-stocked medicine cabinet, he hits her, beginning a long career of brutal wife-beating. They live with Jim’s two brothers: Michael, who hates her, and Edwin, who wants Florie for himself. Florie is introduced to Jim’s “old friend” Mrs. Briggs, a woman jilted by Jim for Florie, yet who somehow has the running of his household. Once children enter the picture, Mrs. Briggs hires the horrible Nanny Yapp, who also defies Florie at every turn (along with wearing her clothes). When Florie discovers that Jim is unfaithful on top of everything else, she starts an affair with his business partner. Jim finds out immediately, and this triggers him to become Jack the Ripper. He wants to kill his “wife-whore,” but he doesn’t want his children affected by the notoriety they would receive if their father murdered their mother. He murders prostitutes in her place and delights in confounding the police. When Jim becomes truly ill, he reveals his actions to Florie. But when he dies, everyone conspires to have Florie convicted of his murder. MY TWO CENTS: I’d like to read a different Brandy Purdy book and see if I really like her writing style. The book is mostly in first person from Florie’s point of view, except for the excerpts from Jim’s diary, in which he chronicles his career as the Ripper in great detail. It’s a mess of repetitive blathering, overlong descriptions of the prostitutes’ backgrounds (especially Mary Kelly’s), and extremely foul language. What you’d expect to find in the diary of a madman, but not enjoyable reading! Even without the Ripper parts, the story of Florie Maybrick is hideously depressing. Before her conviction, she lives as the plaything of various men. She doesn’t have one single ally. She’s the “crass American” in an English world, so she has no friends. She’s not even allowed to run the household or raise her children. The only joy she gets out of life is from compulsive shopping. Of course, after her conviction, things are worse. She spends 15 years in prison, and when released, her children want nothing to do with her. Her life continues a downward spiral until she’s destitute, completely alone, and living in a fantasy world. Otherwise, the book isn’t badly written, although some readers won’t enjoy all the descriptions of settings and items. There are also a few really convenient plot points, like Florie meeting her grown son on the day he “accidentally” drinks poison, or being in the right places at the right time to view some of her adult daughter’s tragic life. BOTTOM LINE: The book did elicit a strong emotional response from me, but it’s not one that I would want others to experience! I would really only recommend this book if you are a Brandy Purdy fan or interested in Ripper lore. I mostly enjoyed the writing style, though, and would like to read a different book by this author. TEACUP RATING: Two-and-a-half out of five teacups. I couldn’t stop reading it, but afterward, I kind of wish I had. WARNING: This book contains graphic descriptions of drug abuse, violence, and extremely foul language. If these are things you don’t appreciate, I recommend avoiding. ON SALE DATE: The book will be on sale in paperback and eformats on October 28, 2014.